Born of Acadian descent in New Westminster on August 8, 1945, John passed away after a short illness on February 7, 2012, at the age of 66, in Edmonton. John met the love of his life, Liz Semmens, BSN’68, while at UBC. They were married for 42 years and had two children: Jean-Paul (née Sean) and Michael. 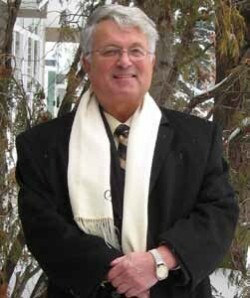 After completing his MSc, John attended the University of Alberta (U of A), receiving his PhD in 1971, followed by post-doctoral research at the University of California, San Diego. In 1973, John and his family returned to Canada where he worked in Ottawa for five years at the National Research Council in laser and plasma physics. In 1978, John joined the University of Alberta’s Department of Physics as an assistant professor. During his 30 years there, he moved up the academic ranks, eventually becoming department chair from 1996 to 2004. John spearheaded the renewal of the department, overseeing one of the largest recruitment drives in its history. His initial conversations lead to the department’s new home in the Centennial Centre for Interdisciplinary Science. John was instrumental in bringing supercomputing to the U of A by helping to build an Alberta consortium called Multimedia Advanced Computational Infrastructure (MACI), later becoming Westgrid. John was a pioneer in time series analysis, ULF plasma waves, and magnetic substorms. He was the first to observe and record specific frequencies of Alfvén waves that he believed were responsible for magnetic substorms – Samson’s “Magic” Frequencies are so named in his honour. His expertise in substorms and in analyzing the optical and magnetic signatures of the aurora borealis, known as the northern lights, brought him in contact with the 2007 THEMIS mission. THEMIS was comprised of five satellites deployed to examine how substorms are triggered and how they evolve. John, as the principal investigator for Canada’s CANOPUS experiment, had expertise in analyzing data from ground instruments, making him the ideal Canadian to work with the THEMIS team. Wave process data observed by THEMIS mission spacecraft are being processed by scientists around the globe using software tools that John originally pioneered for CANOPUS. John’s profession offered many opportunities to indulge in travel with Australia being a favourite, oft-visited location. After retiring as professor and chair emeritus in 2006, John enjoyed daily long walks with his small terrier taking photographs of nature. During summers he sojourned in the sunny Okanagan, motoring through the vineyards in his red MG sports car. John’s mentorship of students and postdoctoral fellows, together with his scientific achievements, helped to mold a new generation of scientists who continue to advance his ideas.